Welcome to the round up for Weekend Herb Blogging #181! Started by Kalyn, and now run by Haalo, this is the first blogging event I ever took part in, so I’m very excited to be hosting it again. Unfortunately, I haven’t been able to take part, but will hope to join you soon in one of the forthcoming WHBs. Many thanks to Haalo for giving me this opportunity, and many thanks to all of you who took part this week! This is a special quiche, with flavours reminisce of mangocheeks’s childhood. She explains it came about from memories of her limited vegetarian school dinner options, “which was mashed potatoes with peas, or chips with beans; or chips with cheese quiche; and then when I returned home, it was my mothers cooking which often included these three flavours cumin, coriander and chilli. So I decided to combine the two flavours into one dish and this is what we have.” Perfect with chips, she says. It sounds absolutely lovely to me! 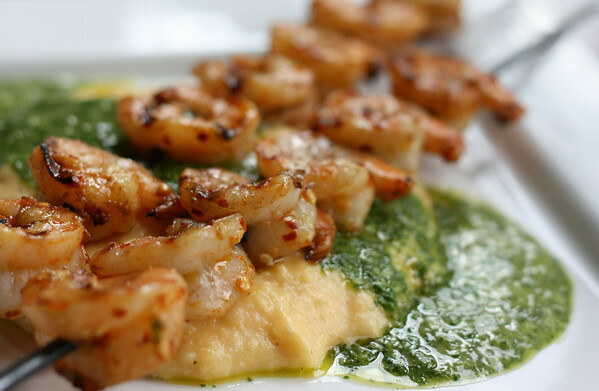 Pam celebrates the bbq season with these gorgeous looking shrimp skewers with cilantro/coriander pesto. The shrimps are marinated in olive oil, garlic, chilli flakes, paprika and lime, grilled and then served with this lovely coriander and lime pesto. This is a dish with a serious zing that just sings out spring/summer. Graziana shares a recipe for stuffed potato croquettes made with marjoram from her garden. She loves this herb, which she says goes really well with walnuts, eggs, cheese and legumes. Here she pairs it with potato and ham to produce some delicious croquettes, worth every bit of effort that goes into making them. Cinzia’s polenta snack with thyme in bloom are not just breath-takingly beautiful, but also a great way of using any leftover polenta if you have it. Actually, I think I might be tempted making it from scratch anyway just to make these little beauties! Brii shares with us a delightful strudel recipe made with ricotta, grapefruit and with the herbs picked from her garden: old man’s beard(clematis vitalba), nettles (ortica dioica), sald burnet (pimpinella o sanguisorba minor) and wall pellitory (parietaria diffusa). 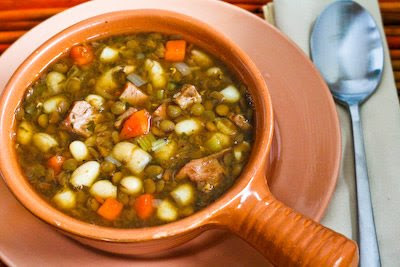 Jude says that “this ancient Berber dish is prepared around March or April in Morocco, when both green almonds and fava beans are seasonally available. The lamb is slow-cooked with ground mace and finished with the almonds, the beans, and a generous helping of sauteed onions.” In case you’re wondering about the almonds, Jude says they tasted like crunchy green beans. Jicama is a root vegetable that is also known as a yam bean or Mexican turnip, that, says Joanne, tastes pretty much like a cross between apple and potato. As such, this C vitamin-rich vegetable is used mostly in fresh fruit salads because of its crisp texture and semi-sweet taste (and here’s a recipe for you! 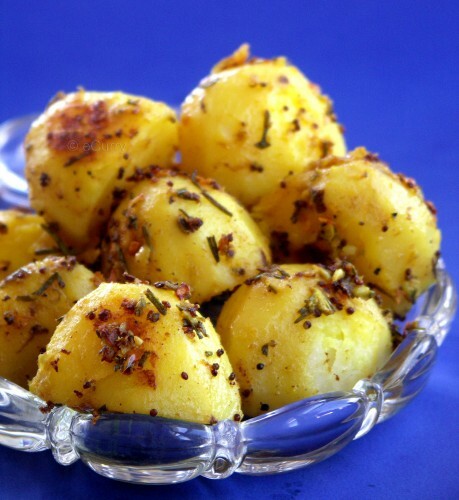 ), “but like any good root vegetable, it can also be mashed, baked, or fried. It’s also a really good substitute for water chestnuts in stir fries.” Very interesting! Thanks, Joanne! Lemon cucumber may be new to many of us, but this description from Jai & Bee makes it very enticing: “This cuke is sweet, lemony and juicy – like a tart honeydew melon – absolutely delicious just with salt and cayenne.” Or try it with this simple and flavourful dal! I’ll be on the look-out for it! This week, Chris from Mele Cotte is hosting Weekend Herb Blogging #182.
good one.. there is always something new in these round ups.. & something to learn.. Always delicious – thank you for hosting Maninas! What a beautiful round-up! Now the hard part – deciding what to make first. Thanks for hosting. Thanks again for this great round up, always interesting and with something new to discover! Funny is the lemon cucumber! Jai, have a good polenta then! Nice job describing the entries. Once again, a very delicious-sounding collection of recipes. Thanks for hosting. Thank you for hosting the event and describing the entries brilliantly. It was such a pleasure to participate and a greater pleasure to read the other entries. Very nice recipes… taks for the RoundUp. Pa gdje si nam ti? Ko da si u zemlju propala?